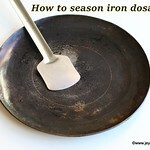 How to season iron tawa, procedure to season iron tawa, with detailed video. This method does not require the usage of rice kanji, seasoning made with simple ingredients. I always have a mind block that seasoning iron pan is a difficult and time consuming thing. Two years back when i bought an iron dosa tawa in Srirangam temple shop, Trichy, the shop keeper told me few easy tips for seasoning it. This method of seasoning the dosa tawa does not need any arisi kanji. But after i came back to Singapore, i got a Lodge pre seasoned Cast iron tawa from my friend in US. Since it was a pre seasoned one, i started using that from that time and completely forgot about this iron tawa which i bought from Srirangam. Recently, when i met a friend, he was telling that he was looking for iron tawa and it flashed me of the one which i had. I told him that i will do the seasoning and give that iron tawa. Also i planned that i will take a video of How to season iron tawa to document my work. 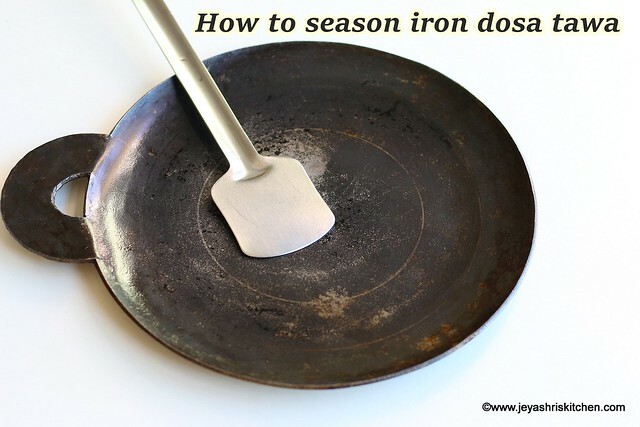 So let's go into the detailed post on How to season iron tawa. Scroll down to see the notes section to find the tips. Description: How to season iron tawa, procedure to season iron tawa, with detailed video..
First wash the iron pan nicely using the dish washing liquid or soap. Do not use the steel scrubber, use the normal scrubber and wash it nicely. Add few drops of oil and little salt on the pan. Spread it nicely on all sides of the pan and rub it. Keep it aside for 2 hours. Rub it with lemon peel and leave it for a day. After 24 hours, wash it nicely and dry the pan. Spread few drops of oil and keep it aside for 12 hours. After 12 hours, wash it nicely and dry, rub it with lemon peel again. Keep it for a day. The next day the pan is almost ready to use. Wash the tawa using a mild dishwashing detergent. Dry and spread little oil. Heat the tawa on a pan. Cut a piece of onion and nicely rub the dosa pan with the onion. Spread a small portion of dosa batter on the pan and just make a thick dosa. Once done do not eat the dosa, the small one is to get rid of the rust smell. Start making slightly thicker dosa for the first times(say for 2-3 dosas) then start making thin crispy ones. Every time you wash the dosa pan after use, dry it nicely and add few drops of oil, spread and keep it inside. If the pan becomes too hot, sprinkle little water and wipe it off. always follow this method to maintain the dosai kal at an even temperature. If it is too hot, the dosais will get burnt. If the heat is very less then dosais will not turn out good. So always maintain the right temperature. Always spread few drops of oil on the tawa after it is washed and dried. This will avoid the dosai kal getting rust. Always use separate dosa tawa for dosai and chapathi. After 24 hours, wash it nicely and dry, rub it with lemon peel again. Wash the tawa using a mild dish washing detergent. Spread a small portion of dosa batter on the pan and just make a small thick dosa. Once done do not eat the dosa, the small one is to get rid of the rust smell. Do one more dosa like this and discard. Thanks a lot! Can the same be used for Hindalium dosa tawa as well?